Many Human Resource and Payroll actions are based on data contained in your employee record. It is in your best interests to review this data to insure it’s accurate and current. 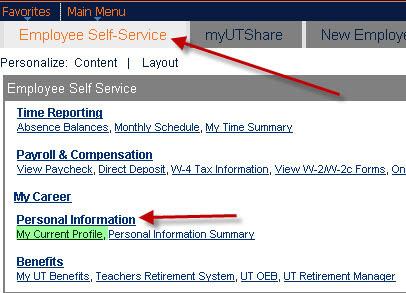 If you are a current employee, the Employee Self Service feature in PeopleSoft provides you the wherewithal to review and in some cases update pertinent information. If you are not a current employee, e.g. a retiree and need to make changes to your data, please contact HR Records via email HR-Records@utsa.edu or call 210-458-7210. If you physically work at UTSA and live in the local area, you should enter your current residence as your Home address. If that’s not your permanent address, enter your permanent address as a Mailing Address. Your UTSA phone number should be marked as a business phone number. This number will be used to populate the UTSA Directory. You may add other phone numbers as long as they are indicated as other phone types, e.g. home, mobile, etc. Your UTSA email address (firstname.lastname@utsa.edu) automatically defaults to the business email address and is checked as Preferred. It cannot be changed. You can however, add additional email addresses, e.g. home, campus, etc. Click on this link (https://my.utshare.utsystem.edu ). Log in with your myUTSA ID and passphrase. Assure you are on the Employee Self-Service tab. Click on the Personal Information Summary link under under the Personal Information section. You can restrict the release of your home address, home telephone number and information about your Emergency Contacts to outside agencies. Click on the My Current Profile link under the Personal Information section. 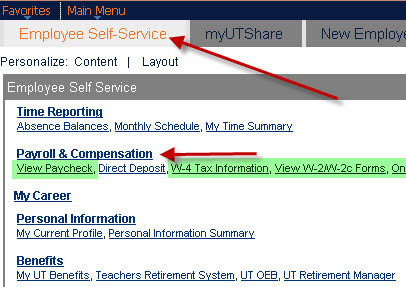 Click on the available options under the Payroll & Compensation section. Click on the Time Reporting section. Click on the Absence Balances link under the Time and Reporting section. 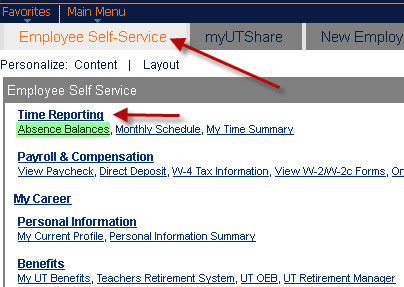 Balances are based on time entered in PeopleSoft. *Or the following business day, if day falls on weekend or Holiday.